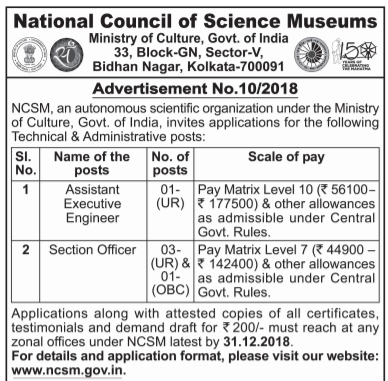 NCSM is stands for “ National Council of Science Museums”. It is an independent scientific association under the Ministry of Culture, Govt. of India. NCSM Recruitment department invites Government job applications for the following posts which we explained below in this article. 01. The post(s) carry all India transfer liability. Allowances such as D.A./H.R.A/Transport allowance are admissible as applicable under the rules of NCSM. 02. Relaxation in age limit will be allowed to SC/ST/OBC/PWD/Ex-Serviceman and departmental candidates as per Govt. of India rules. 03. Prescribed application form may be obtained from the Council’s website: www.ncsm.gov.in or from the respective zonal offices at Kolkata, Mumbai, Delhi & Bangalore by sending a self-addressed envelope (10x24 cm) affixed with postal stamp of `10/- denomination super scribed on the top, “Application for Assistant Executive Engineer / Section Officer against advertisement no 10/2018”.